In a single day, a farmworker can spend 12 hours bent over, pausing only to lift buckets of produce that weigh up to 40 pounds in the blistering sun, often not making enough money to break through the poverty income threshold. Migrant and seasonal farmworkers are one of the most underserved, exploited and understudied populations in the United States. When they come home from 12 hour shifts, they do not have adequate resources to combat the social, legal and medical issues caused by their occupation. The U.S. must recognize that farmworkers are entitled to quality health care, just like any other American. There are an estimated 3 million migrant farmworkers in the U.S., and a Western Journal of Medicine study found that 80 percent of those surveyed do not have any type of health care. Undocumented migrant workers do not have access to health care because of their legal status and those who do have legal status typically cannot afford health insurance. Farmworkers who seek medical attention have to overcome language and distance barriers and often put off receiving care until their pain is unbearable. According to a study by Health Outreach Partners, “67 percent of those polled reported lack of transportation as the biggest barrier to accessing health care amongst farmworkers.” Seasonal farmworkers also have to constantly move, looking for the next harvest, making it hard for them to settle in one place and find the resources they need. In the U.S., 61 percent of farmworkers’ incomes fall below the poverty line. According to an Economic Policy Institute study, the average field worker only makes $17,500 annually. A family of four must make $62,882 to make a living wage, and even if both parents work they would still fall well below the living wage. Many farmworkers live day by day, barely making enough money to buy food — for them health care is a luxury. Yet because of many people’s documentation status, farmworkers are at the discretion of their employers and do not complain for fear of retaliation or deportation. They are constantly exposed to dangerous working conditions, yet cannot see a doctor if anything were to happen to them because of their legal status or money. Each year around 45,000 pesticide products weighing 1.2 billion pounds are sold in the U.S. and 70 percent are applied in agriculture. Pesticide exposure is linked to serious medical and health issues such as reproductive problems, birth defects, Alzheimer’s, diabetes, cancer, autism and memory loss. The Occupational Safety and Health Administration lists agriculture among the most dangerous industries to work in, yet farmworkers receive little to no support. Farmworkers have to deal with intolerable physical pain from years of arduous physical labor and face daily exposure to pesticides and dangerous chemicals. Farmworkers’ painstaking labor is essential to the success of the $136.7 billion agriculture industry that accounts for 1.052 percent of the country’s GDP. But because of their legal and economic status, migrant workers are easy targets for exploitation. They don’t have the privilege of receiving the same labor protections that an engineer at a high-tech company in the Silicon Valley would expect. Many farm owners don’t follow federal labor laws and exploit workers to increase their economic revenue. Republican lawmakers are pushing bills that would increase the number of foreign workers allowed to work in the U.S. Lawmakers are cognizant of how crucial Latinx farmworkers are to the success of the agricultural economy, yet they do nothing to support them. 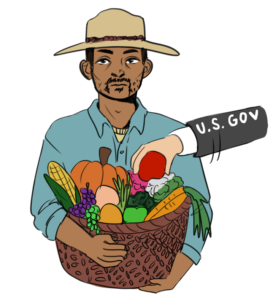 The backbone of the American agricultural economy relies on the exploitation of Latinx migrants, yet they are denied the social, legal and medical help they deserve. The average age of a farmworker is now 45 years old, and this figure is rising due to younger migrants seeking less physically demanding jobs. Older farmworkers are not able to access the care they need for their debilitated bodies after decades of working in the fields. Farmworkers also face health problems from prolonged exposure to dangerous chemicals and pesticides. Even while they are not at work, pesticide residue on workers’ clothes can pollute the air in their neighborhoods. Farmworkers work extremely hard to sustain the agricultural industry and to provide us with the food we need to survive. Their presence and importance must be acknowledged and they must receive the same protections and benefits of any other working person in the U.S. There must be a change in the U.S. health care system to increase accessibility to farmworkers, a workforce the entire American population depends on.